The Blue Healer was a root doctor who was brought here via The Middle Passage to become a slave. He was a renowned root doctor and healer in West Africa. Legend says that his skin was so dark and rich, that it shone blue and he was known to be able to cure with the simple laying on of his hands. 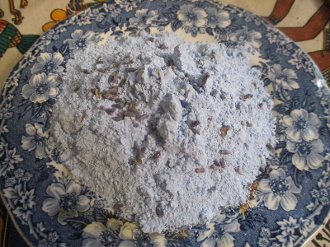 Powders can be used to dress mojos, candles, bed linens, shoes, floors and even the skin. Use along with my Blue Healer candle and oil for a hoodoo wallop!